Below is a Transcript of President Muhammadu Buhari’s Speech at the Signing of a Second Peace Accord by Presidential Candidates today in Abuja. 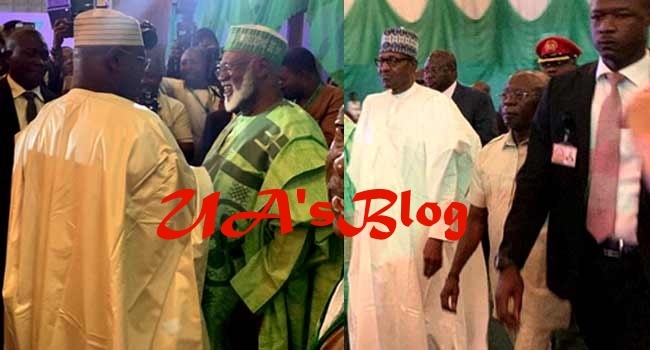 Buhari signed a peace accord with the PDP Presidential Candidate, Atiku Abubakar to prevent any fallout or crisis after Saturday’s elections. “Another election is upon us and not unexpectedly, there is anxiety in the air. This is typical of any form of competition and contest, no matter how well prepared all contestants and regulators are. The forthcoming elections are very special and significant for the growth of our Democracy. First, they come immediately after one of the most peaceful elections in the history of our country. I am not saying this because I was blessed to emerge as the winner. I am saying there had been a lot of fears and anxieties from within and outside Nigeria about the future of the country. We are hopeful that this is evidence that we are all maturing in our disposition towards electoral outcomes. We see this as an opportunity to grow our sense of political culture in Nigeria. Secondly, we are witnessing an exciting development in the area of the engagement of our Youth and Women in the democratic process. Hitherto, these groups have often not been in the mainstream of our political competition. It is in appreciation of their contribution that we passed the Not Too Young to Run Bill last year. The success of the Act is illustrated by the unprecedented number of young men and women who have stepped forward to participate in this process as Candidates at all levels. Significantly, we have witnessed also the emergence of Women as Candidates across the political space. Thirdly, these elections are taking place against the backdrop of the emergence of an unprecedented number of Political Parties. As of now, we have 91 Political Parties, out of which over 70 fielded Presidential Candidates. Although some Candidates have dropped out of the race, there is no doubt in our minds that our country is moving forward and that our democracy is expanding and also deepening. 5.I call on all Nigerians to contribute to the building of a viable polity by more active participation well beyond the mere casting of votes. Elections by themselves do not constitute Democracy. It is the spirit of citizenship engagement that utilizes the energy of citizens towards the attainment of good governance.